Ann Tappan grew up in Montclair, New Jersey where she started playing piano at the age of four. After a brief romance with the folk guitar in her teens and a two-year residence in Europe, she entered Berklee College of Music to study jazz composition and arranging. She returned to New York in the mid-70’s and connected with the improvisational avant-garde loft scene. In 1975 Ann moved to Berkeley, CA, to study with ECM pianist Art Lande and became part of his experimental jazz school, first as a student then as an instructor. During her time in the Bay Area she wrote and arranged for many live and recorded projects and performed with such giants as Eddie Henderson and Joe Henderson. In 1993 she migrated to Montana where she quickly became a busy performer, private educator, and teacher of the award-winning Bozeman High School Jazz Combo. She was the author and administrator of a 2001 MAC/NEA/Jazz Montana grant, a year-long creative music program linking national and local professional musicians to state-wide audiences and K-12 students. Since living in Montana she has recorded eight CDs with the groups ThreeForm, Springhill and the Tappan/Roberti/MJ Williams Trio and Quartet. She has performed widely in the Northwest, including concerts at the Myrna Loy Center in Helena, Yellowstone Art Museum in Billings, Bumbershoot Arts Festival and Jazz Alley in Seattle, the Jazz Montana Festival, Madison River Music Festival and opening performances for Joan Armatrading and Dave Grusin in Bozeman. Tappan traveled to the 2002 Prague International Jazz Festival in the Czech Republic. She returned to the Czech Republic in October 2003 and 2005 with Springhill for performances at several international jazz festivals in and around Prague. She has toured in Montana with NYC vocalist Roseanna Vitro, performed with David Murray in Bozeman and collaborated in performances with vocalist Carola Vossen, from the Netherlands and NYC vocalist Andrea Wolper. She has collaborated with Montana musicians MJ Williams, Kelly Roberti, Alan Fauque and Brad Edwards in tribute concerts honoring the music of jazz greats Abbey Lincoln, Carla Bley and Steve Swallow, and Wayne Shorter. Recently she was featured on the Montana PBS arts program, “11th and Grant”, hosted by Eric Funk. She performed on two of the shows, “The Tappan/Roberti/Williams Quartet” and “Christmas Favorites”. She was a faculty member (along with Phil Aaberg and David Morganroth) of the Montana Jazz Piano Workshop, and Bozeman’s “Camp Epic”. 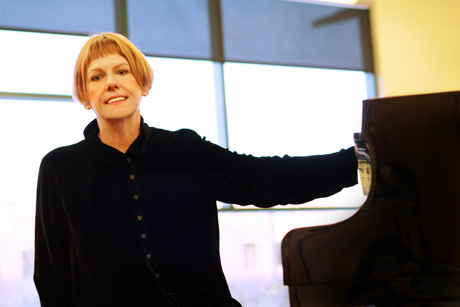 She continues to maintain an energetic studio in Bozeman and Manhattan, dedicated to educating the young people of Montana in classical and jazz piano, improvisation and jazz vocal coaching. She released a CD, “It’s About The Song…”, with the MJ Wiliams Trio in 2014. In 2015 her band ThreeForm, from the 1990’s, reunited in the 1+1=1 Art Gallery in Helena, MT for a sold-out concert. The band is presently creating new works. Ann appeared at the Old Faithful Inn in Yellowstone Park in 2016 (for the second year) from June 15 to July 12. She was Artist in Residence at Hanford High School in Richland, WA in February of 2017. Ann released her newest album,“Paintings”, in April 2017. It features original compositions, compositions by friends, and features the finest jazz musicians in Montana, including newly re-located bassist, Bob Bowman.